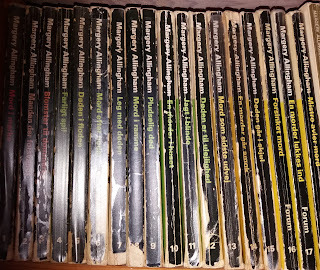 The Return of Mr Campion - Margery Allingham. 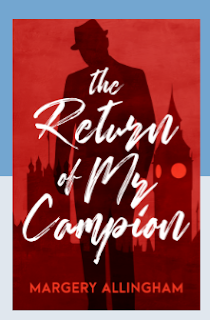 The Return of Mr Campion by Margery Allingham. This is number 29 in the Chief Inspector Littlejohn series. The story takes place on the Isle of Man. 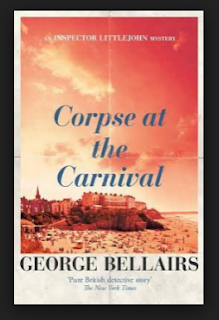 It is carnival time in Douglas and during the parade an old man is stabbed to death . He is known as Uncle Fred. At the same time Littlejohn arrives on the island to visit his old friend Archdeacon Kinrade and Detective Inspector Knell asks him for help. It turns out that Uncle Fred has used different names throughout his life, but gradually his life, before he moved to the Bella Vista boarding house, unfolds. During the investigation of the crime, we get to know quite a lot of the island, and there are many lovely descriptions of places, nature, locals and their faith about "the little people". 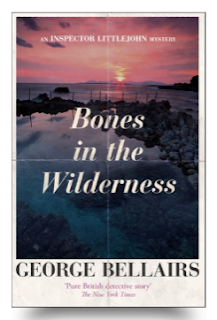 Bellairs really must have liked staying there. You even want to go there yourself after reading the novel. It is a well-written story, enjoyable to read about the Isle of Man and the ever so sympathetic Chief Inspector Littlejohn . The plot is fine as well. This is number31 in the Littlejohn series. Samuel Cheever a broker and secondhand dealer with a bad reputation goes to France to buy antiques. He stays away for a long time and people begin to wonder what has become of him. His wife doesn't seem to care much, bur when the local MP continually asks: What's Happened to Cheever, Littlejohn and Cromwell are sent to Francaster to investigate. Here Cromwell buys a miniature from Mrs. Cheever and it shows to be important in the investigation. When a set of false teeth found in an unidentified body at Etang de Vaccarés, Littlejohn and Cromwell travel to France. In order to solve the case they go to different places in France - The Camargue with bulls, horses and gardians - Bresse with poultry - Dombes with it's many lakes - Provence. There are wonderful descriptions of the life, the food, the wine and the different regions. Thanks to Crime Classics, Net Galley and Agora Books I was able to read 4 short stories from one of my favorite writers of classical crime stories. The novels feature Albert Campion in three of the stories. Two are crime stories and one is Christmas with his wife Amanda and the dog, Poins. The last novel, Happy Christmas , is about a couple celebrating Christmas like Victorians and with the help of an old lady living at the top of the house. Margery Allingham is always delightful to read, so this was a real Christmas treat! This will be the last post in English - at least for a while. It is rather time consuming to write the posts in both English and Danish, and as the Danish have the most viewings I will continue there. It has been great practice writing in English. I read a lot of English books, but my active vocabulary needed to improve. 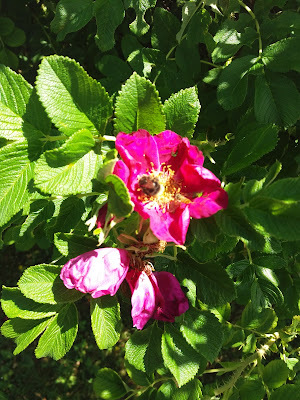 Should you be interested in my Danish blog, and if Google translate doesn't make sense you are welcome to comment on the Danish blog and I will try to be of help. Cast on 60 stitches and knit 6 rows and then pattern. 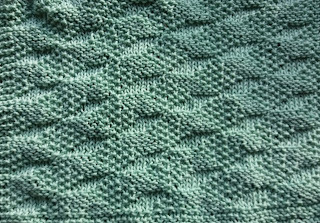 Remember to start and end all rows with 3 k. When the cloth has the desired length you knit 6 rows and bind off. Chop the onion and press the garlic and put it in the slow cooker together with the spices, cream cheese and yoghurt. Mix well and put the diced chicken breast in the cooker too. Stir and then pour the tomatos in the cooker too. Mix well and distribute the butter on top. Cook at MEDIUM for 7 hours. 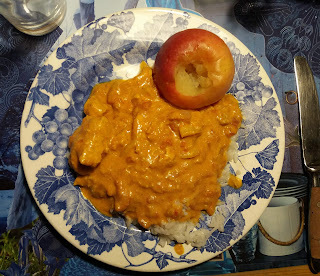 Serve with rice and a baked apple.